Pearlware Transfer Printed Plate c.1790. 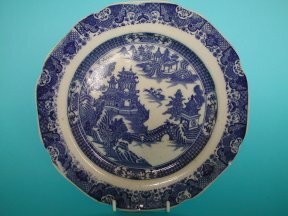 An attractive underglaze blue printed pearlware plate. Printed with an interesting Chinoiesorie print. It measures 22.cm. diameter. A Spode 'Girl at the Well' Transfer Printed Plate. 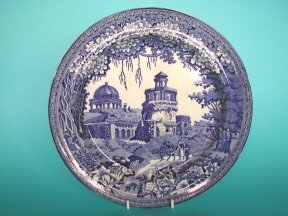 An early 19th.Century marked Spode underglaze blue transfer printed pottery plate. Measuring 25cm. diameter. Printed with the attractive 'Girl at the well' pattern. The eight lobbed rim printed with a narrow border pattern overlaid with three repeated floral patterns. Dates from c.1820-30. A Pearlware 'Monopteris' Pattern Plate. A Pearlware 'Monopteris' Pattern Plate. 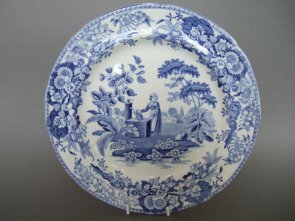 An attractive pearlware transfer printed plate, 25cm. diameter. Almost certainly made by John Rogers & Son of Longport, (c.1814-36) Printed with the 'Monopteris' pattern from the Ottoman Empire series. There are no makers marks. Good, just a couple of retouched glaze flakes to the edge of the rim, (see third picture) and some typical crazing to the glaze. 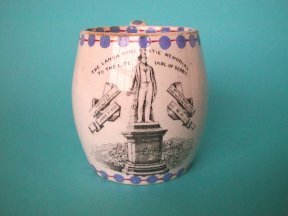 An English pottery mug, transfer printed under the glaze in black with a print entitled 'The Lancashire Statue Memorial To The Late Earl Of Derby'. Edward Stanley 14th. Earl of Derby was born at Knowsley Park in Lancashire in 1799. He had a long career in Parliament from 1820 -1868 and was Prime Minister three times. He died in 1868. This mug commemorates the 1873 unveiling of a Statue in memory of Stanley in Miller Park Preston Lancashire. The mug stands 8.6cm. high.